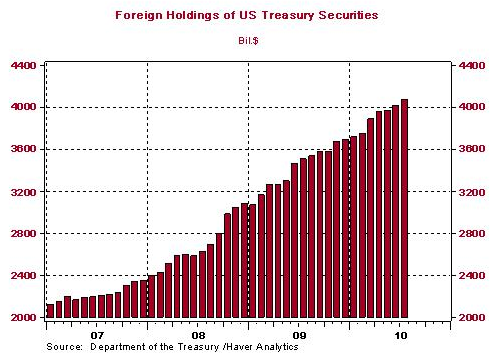 International holdings of Treasury bonds have nearly doubled since the start of the financial crisis, Asha Bangalore at Northern Trust notes–from $2.2 trillion to $4.1 trillion. On behalf of the debtor-nation US, we thank you, world. That’s another $2 trillion we owe you. On top of the original $2 trillion. « Did Obama’s $200 Billion Tax Cut Just Light A Fuse Under The Market?